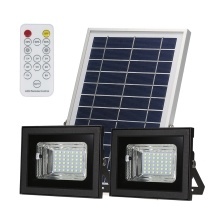 *42 SMD LEDs each light,solar dual-head flood light to illuminate for a large lighting areas,you can install the light as a security lights or landscape lights for your garden,backyard,pathway,etc. *Powerful solar panel and lights:Dual solar lights with big solar panel(29*19cm/11.42*7.48in),high solar transfer efficiency makes it faster to charge;3.7V 2200mAh lithium battery ensure longer lighting time and stable performance. *IP 65 Waterproof protection class to withstand extreme weather conditions,very practical for using. *Equipped with 16.4ft length cables between solar panel and the light for your normally using.